What Happens to a Check After You Cash It? When you step back and think about it, checks are pretty amazing. A small slip of paper with a few words, some funny-looking numbers and a signature can give you access to money in someone else's account, potentially located at a different type of financial institution in a different state or country. While cashing a check is a relatively simple process for you, there's a lot going on behind the scenes. Before you go to a bank to cash a check, make sure you're going to the right bank. If you have an account with the bank, you can cash the check if there's enough money in your account to cover it. Otherwise, the bank may choose to hold the funds. If you don't have a bank account, the bank that issued the check should cash it for you. If you take the check to a bank that doesn't have a relationship with you or the check, they don't have to cash it, or they may charge you a fee. Once you get to the teller's window, you don't just give her the check and walk away with your money. First, you have to endorse the check. When you endorse the check, you sign the back of it to show you received the check and want to have the money that it represents paid to you. 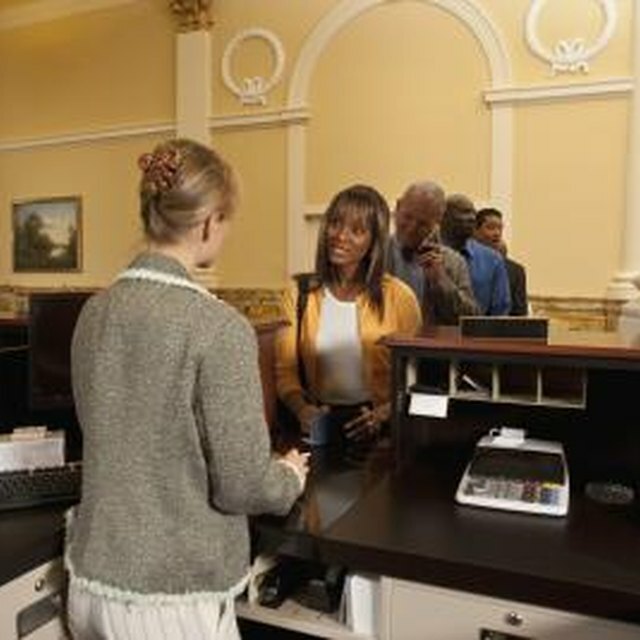 Once you give the bank teller your check to cash, she will usually run it through a scanner and may also enter some information on the computer. The scanner reads the numbers printed on the bottom edge of the check, which contain three pieces of data: the check number, the account number and the routing number for the bank that issued the check. In addition, the teller either enters the dollar amount of the check by hand or, in some cases, the scanner will capture it for her. Years ago, checks had to be sent to a big clearing house that physically matched up checks between banks for payment. This made check cashing a bit of a risk for banks, since there was a possibility the money wouldn't be there when it came time for the bank to collect on the check. Today, the data from a check you're cashing goes through an electronic clearing house or, in some cases, transfers through a direct connection between two banks, bypassing the clearing house. These clearing houses and connections let the bank see if the money is there before it pays you. If it is, you'll be given your funds. Consumer Finance Protection Board: Can I Cash a Check at any Bank or Credit Union?